Property Information: 2 BR, 1 BA Beach Home with 499 sq. ft. Luxury beach resort home for sale in Santa Cruz CA. The perfect little beach house! 2 units! Main house is a 2/1, garage conversion is a 1/1. Just steps to Seabright beaches and shopping. Walk to Betty's Burgers, Seabright Brewery, Verve Coffee, and the Surf Museum. This charming home is perfect for a weekend getaway, second home, investment property, or anyone who just wants to live close to the water. There is an ocean view from the front of the house, separate laundry room, and plenty of yard for pets or kids. This Santa Cruz CA home has it all! If you're searching for the quintessential California beach town, look no further than Santa Cruz! It was here that surfing was introduced to the mainland by Hawaiian royalty. Home to the legendary Santa Cruz Beach Boardwalk, a pedestrian-friendly & tree-lined downtown area, and the historic Santa Cruz Municipal Wharf, which stretches out a half-mile into the waters of the Monterey Bay National Marine Sanctuary. Other highlights include UC Santa Cruz, the Santa Cruz Surfing Museum, and nearby redwood forests. 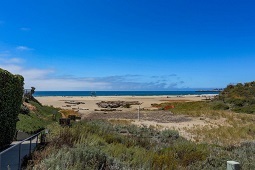 Santa Cruz has mild weather throughout the year, enjoying a warm-summer Mediterranean climate characterized by cool, wet winters and warm, mostly dry summers.